This is the building that started it all for me. I began construction of the sides in 2001. Each side of the lower 16-story section is a single, contiguous piece of matteboard - a design decision that would haunt me for years to come. Because of this, doing any kind of work, or even just moving the building is a mandatory two-person operation, because there isn't enough room between the table and the ceiling to pull the building off of the base and clear the top of the internal lighting dowel. Later, I built an exact copy of West Park Tower, sans the 6-story extension on top. This second building I segmented into two halves, and that makes it much more manageable to work on. I always had an interest in making a real downtown scene of a good-sized city for my layout. It's difficult to marry this with an equal interest in keeping the layout focused on trains. As much as I enjoy the large, office-style downtown buildings, I don't want to end up with a layout that is really just a model city that happens to have a train running around it. What will end up happening, then, is that I will create a relatively realistic, yet totally fictitious city - one where trains are heavily integrated into the downtown area. This will be easy for the train stations, but getting the rest of the main lines to weave in and out of the city buildings will be challenging. The windows were without question the most difficult part of creating this building. Each one was individually cut out of matteboard using an X-acto blade: all 650 of them. That's one of the reasons they look a little shoddy - especially in the corners. These pictures are hiding a lot of details which would reveal significant flaws. But overall, it's hard to notice these flaws when looking at a whole building full of nearly identical window cutouts. My intent with these buildings is mostly to create an impression. At the same time, I try to realize as much detail as possible without making a career out of mending little corners, and painting little bird droppings on the sidewalks. If I'm going to make a multi-block city, that implies at least a dozen or more good-sized buildings. And I just can't spend that much effort on each one. Compromises have to be made. There is no interior finishing. The windows are not only tinted dark - to keep existing light from getting inside and artificially illuminating it - but they are also "foggy" so that viewers cannot really see inside. 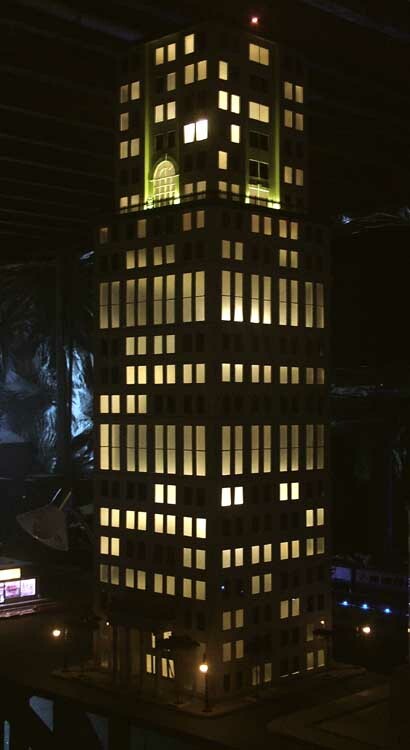 The internal lights inside still cause the windows to glow for night scenes, and the end result is very stylized. Although not convincing on an individual, building-by-building view, it is surprisingly realistic when stepping back and taking in a city of a dozen or more of these buildings. 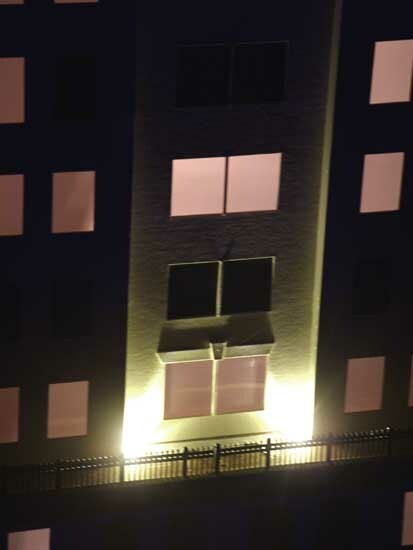 These external lights are placed on the roof of the lower part of the building, and they cast light upwards against the sides of the upper building. This casts elongated shadows which help create the illusion of even greater height. The first time I thought I had completed this project, I learned two very important things: 1) you really can't build these things strong enough, and 2) the window material I used was far too flimsy to rely on for the look of a solid pane of glass. So I ended up refurbishing the whole thing with plexiglass. 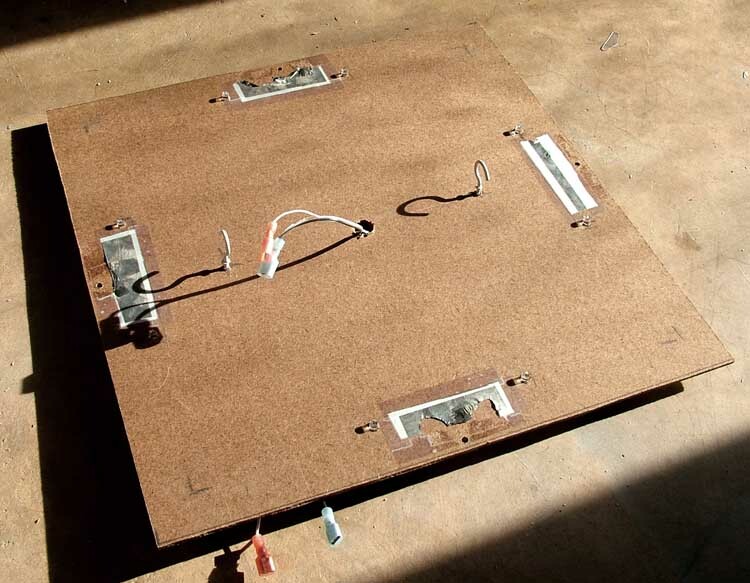 This is even harder than it sounds when you realize that plastic and cardboard do not glue together well. I had to use a very special and yucky kind of adhesive in order to attach the plexiglass pieces to the existing matteboard. Then I had to strengthen the whole structure with horizontal wood struts and corner braces. These corner braces lend a tremendous amount of strength to the overall building. Also during the overhaul, I decided to "black out" more windows than I had originally. 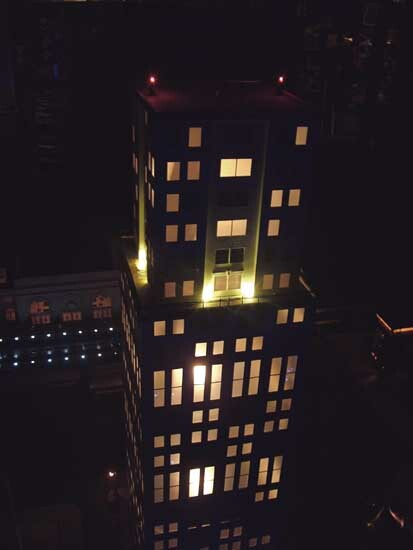 This is important for a reasonably realistic night-time scene: you'd be surprised how few windows are actually lit on a real skyscraper at night. I learned a lot about electrical wiring, too. Although fairly straight-forward, I realized half way through making this building that the wiring needs to be as modular as possible. I end up taking the building apart and putting it back together again quite a bit. 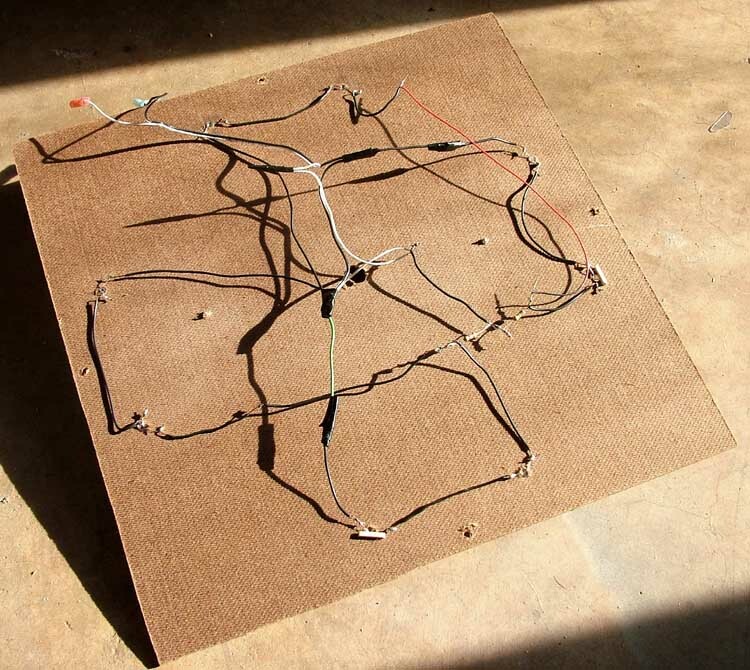 When I do, all the wire connections I had made by just twisting them together (a terrible practice) must be forced apart so that I can separate the roof, upper building, lower roof, and lower building. This disassembly is necessary even for just replacing a burned-out bulb. So I got a pack of male-female quick-disconnect plugs from Radio Shack and crimped these onto the connections, and I can't tell you how worthwhile this is to do. Disassembling and reassembling the building can now be done in a fraction of the time it used to. The interior lights are simply mounted on a dowel that runs vertically in the center, which is mounted in the wooden base. The interior lights for the upper section are mounted an another dowel, this one suspended from the upper roof. 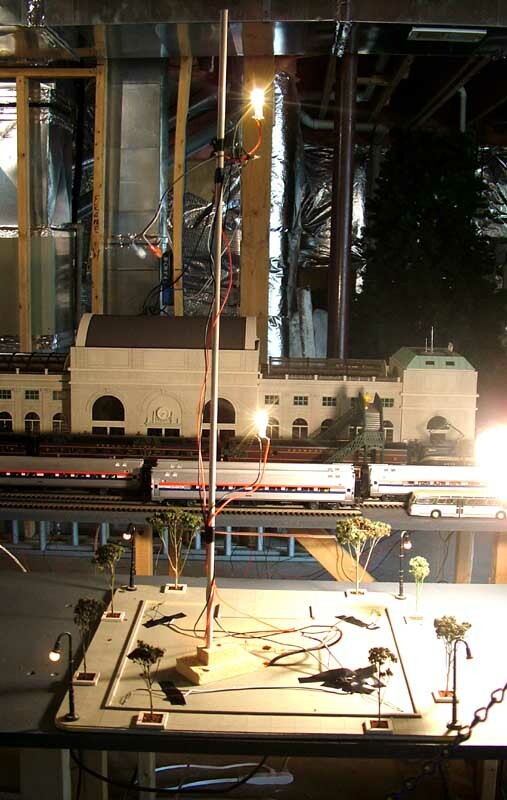 Those are MTH RailKing street lights on all four corners of the base. The people are K-Line, as well as the benches. The bus is a Corgi modern Greyhound, but the sidewalk is just more custom-cut matteboard that I scored the grid lines into with an X-acto knife, and then spray painted gray. The trees are a gift from my Dad. He grows this stuff called "Sedum" in his back yard. This stuff makes perfect trees, in my opinion. I just cut them to the length I want, then spray them with a plastic sealer (clear coat fixative), and then spray the tops with a green spray paint of some kind. 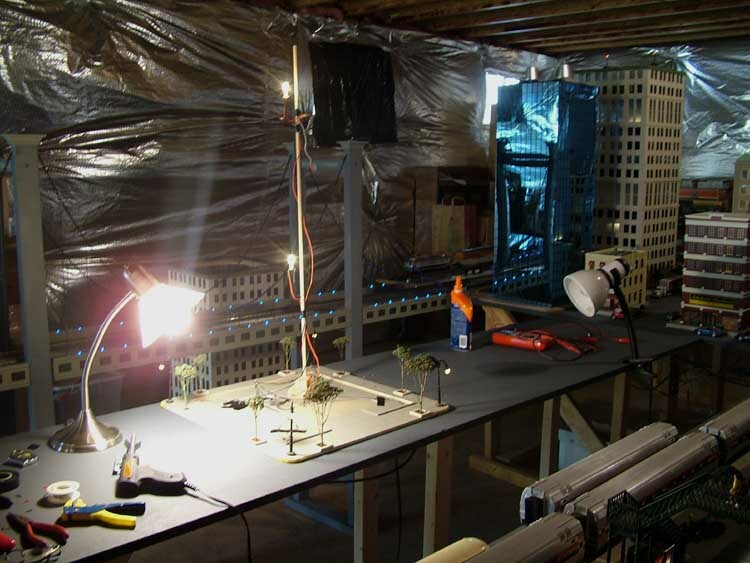 Very simple, very inexpensive, and far more realistic than the trees you can buy from scenery makers, in my opinion. One of my major goals is to learn how to make large, quasi-realistic buildings in the most inexpensive ways. I prefer to use inexpensive materials and paints, and I only resort to pre-made stuff when it really makes sense. The black iron fencing is an example. At first, I tried to make this myself with little wooden twigs, but this was not only excruciatingly difficult and time-consuming, but too fragile to be practical. The black iron fence is Model Power's HO scale version. Total building costs, including the wooden base with sidewalk, all 16 light bulbs, the RailKing street lights (which run an astonishing $12.50 each), matteboard (or "museum board" will also work - although more expensive), wooden square dowels for the corner struts and framing, a bottle of white glue, and paint - is probably in the neighborhood of $150. Oh by the way - although I refurbished the windows using plexiglass, that was only because my first choice for window material was very flimsy and ended up looking like I just stapled some translucent trash bags all over the inside. In my subsequent building project (the "Berliner") I'm using a much more practical and far less expensive window material. Go to your local Office Depot and look for the smoke-gray plastic folders shown in this photo: http://localhost:8080/Trains/Bldg2/bldg2.htm#oxford. This stuff cuts like butter, yet is "dimensionally stable" enough to serve as windowing material. It's already tinted, and also has a "foggy" characteristic which is perfect for this application. This building turned out better then I thought I could achieve, given my skills. It is by no means a "museum quality" piece, but I think it fits in well with the level of realism in the rest of my layout. The hardest, most tedious, and most time-consuming part was cutting out all those windows. There's got to be a better way. I started looking for existing materials that already have these rectangular shapes cut out of them. One day, I glanced down at a pile of 35mm slides, and realized that these are perfect. It didn't take long to find empty 35mm cardboard slide sleeves for dirt cheap on the Internet (see the article on the "Berliner": http://www.jcstudiosinc.com/Trains/Bldg2/bldg2.htm for details), and then I was able to create an entire new downtown building from these - without cutting out a single window with my X-acto knife! When I decided to switch all my layout buildings and accessories to 12V DC power, the little bulbs I had been using inside most of the buildings were too dim. These are rated for "12 to 16 volts", and truthfully were a bit too dim on 14 volts, but definitely nowhere near bright enough on 12 volts. So I started looking around for alternatives and discovered some 12-volt 4-watt bulbs at Home Depot that are intended for outdoor lighting systems. These work very well for the vast majority of my buildings. 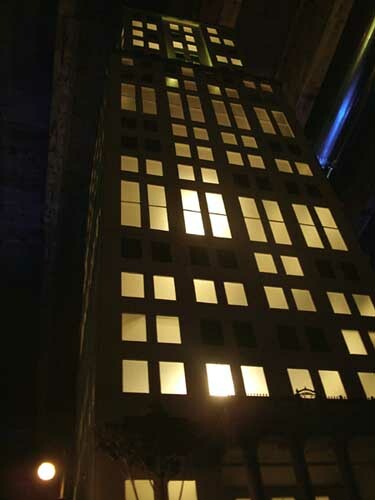 Two of them are enough to provide ample internal lighting for the 16-story bottom section of West Park Tower, and a third single bulb lights the interior of the smaller 6-story upper section. While I was in there, I decided to upgrade the external accent lighting that illuminates the recessed panels of the upper section. I had originally installed a single bulb under each of the four window panels, and these were just not producing the effect I had envisioned. So I replaced each one with a pair of warm-white LEDs, and this made a world of difference. The building draws more current than it used to, but it's still under 18 watts total, and it looks much better, especially in night scenes.